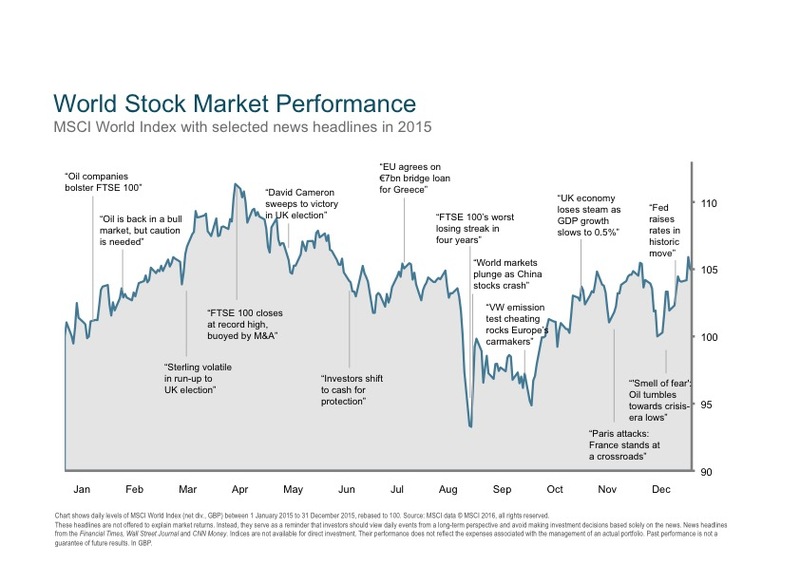 After several years of seemingly uninterrupted growth, 2015 was marked by increased volatility. The year got off to a good start with many markets around the world reaching record highs in April, but stocks fell dramatically in August, led by a sharp decline in Chinese share prices. Developed markets returned 4.9%, emerging markets dropped 10% and the market-weighted combination of developed and emerging returned 3.3%. The weakness in emerging markets was led by China, the world’s second largest economy, which showed signs of a slowdown during 2015. The economy was reported to be growing at an annual rate of 7% in Q1 and Q2 but fell to 6.5% in Q3. This is less than half the growth rate in 2010 and the weakest growth in 25 years. Globally, economic growth was the weakest since the financial crisis. In December, the Organisation for Economic Cooperation and Development (OECD) revised its 2015 world growth estimate downward to 2.9%—well below the historical average of 3.6% per year. Oil continued its dramatic slide. After falling more than 50% in 2014, it declined another 30% in 2015, marking the largest two-year price drop on record. 2015 was the first time since the euro’s launch that the Fed, ECB and Bank of England struck different monetary paths as a result of diverging economies. The Fed raised its benchmark rate by a quarter point in December—its first rate hike since 2006—and stated that it would continue on a gradual course of monetary tightening as long as inflation and economic growth allowed. Since the financial crisis of 2008-09, global equity markets have enjoyed strong returns in spite of concerns about the sustainability of economic growth. Volatility in 2015 has caused some people to consider the possibility that the post-crisis bull run might be coming to an end. Whether or not this is the case, investors should remember that over the long term, they are generally rewarded for taking the rough with the smooth. The chart above puts 2015’s return in a long-term context. 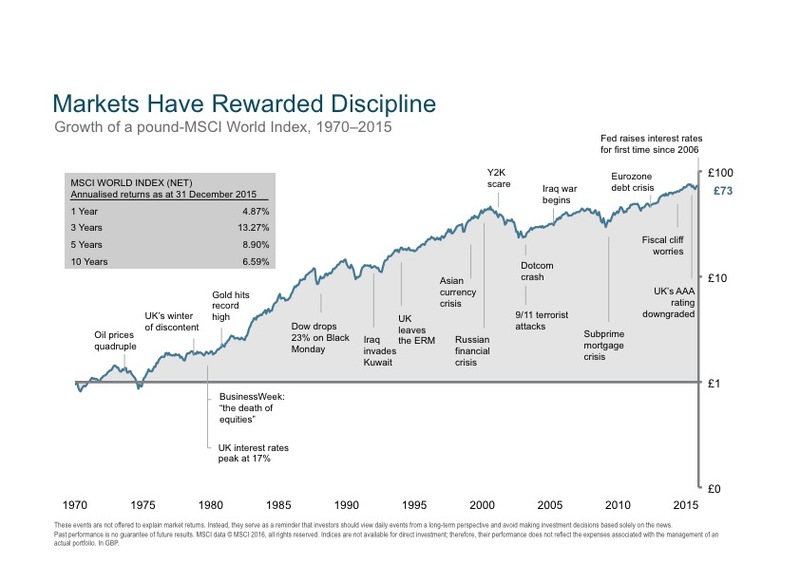 It illustrates that investors have enjoyed positive long-term returns throughout the 1970s crisis; Black Monday; Black Wednesday; wars; currency crises; and bubbles and crashes. People with a long-term financial plan and a diversified, disciplined approach to investing can still expect the capital markets to be the main driver of returns.